The day is bright as i walk through the ferns to Boscowen-Un stone circle, although the season has already decidedly turned to Autumn and I see the red berries on the hawthorn and blackberries in the hedgerow. We are the living embodiment of the Earth’s energies moving through us. As women our bodies are married to the cycle of nature which governs all life on Earth. It is a cycle of growth, flowering/ fruiting, harvest, decay, death and re-birth. 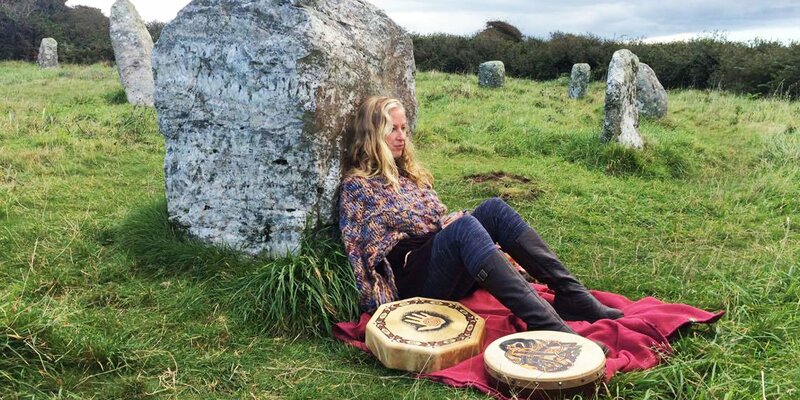 We can represent this grand cycle of nature today as our pre-Celtic ancestors would have done by standing in the circle where we currently are within that cycle. We each move to the quadrant of our menstrual cycle, mother cycle or moon cycle and invite our men to stand opposite us. Our circle is cast and we can clearly see the energies of inner winter, inner, spring, inner summer and inner autumn represented through our bodies present in the circle. We have come together today to honour the Land, our beautiful Cornwall, and ourselves as awakening woman and men. We recognise that a women’s menstrual cycle is one very tangible way to come back home to relationship with our bodies and therefore restore our relationship with our Earth. At Autumn Equinox day and night are now at equal length and we can seek that balance also in our bodies and our lives. Spring and summer are now behind us – the masculine half of the year of agency and ‘doing’, and now we cross to autumn and winter the feminine half of the year of drawing into darkness and the energy of encountering ourselves and ‘being’. At Autumn we give thanks for the harvest and abundance in our lives, our inner harvest, all we have created, shared and given. We take a moment to see the person who is holding the opposite pole to us in the circle and make eye contact with them. These partners / pairs are each invited to step into the centre of the circle and to share their name, where they are from and to plant a seed for themselves and others in their lives with intention. They also both exchange shawls or coats. Autumn in the menstrual cycle is often the most difficult time for a woman, as is the last trimester of pregnancy, as are the months leading upto the unknown transition of menopause. With each there is a build up of tension before letting go. In the Autumn we draw in and we have a chance to meet our shadow delves, our inner critics. the parts of ourselves which ‘shout the loudest’ protesting in the face of death / dying and letting go into winter. Our pre-Celtic ancestors lived by the seasons and our cyclical nature. each of the four sacred sites that I hold Red Tent Cornwall ceremony at I understand that our ancestors would have come to honour the Rites of Passage of our people. Here at Boscowen-Un stone circle we would have honoured the female elders of the tribe. At menopause they would have stood in their medicine name and been given the shawl of wisdom. Today to honour ourselves and our female ancestors as both men and women. I invite each of us present to consider what our gifts, talents or strengths are…our medicine…for we can be certain that it is because of their lives that we have them. We each imagine that we can honour our land, our ancestry and ourselves as cyclical beings by naming our gifts. We feel the Earth energy at this sacred site rise up through our bodies and fill us with courage to each step into the circle and re-name ourselves with our medicine names. As we speak our partner wraps us in our shawl/ coat that they have held for us so we feel wrapped with the warmth and love that we have been witnessed, seen and heard in the harvesting of ourselves to take into winter. Tears well-up in my eyes as I see each woman and man speak without shame what gifts they bring to our Earth. My heart fills with appreciation to stand in this circle. I am moved by the strength of our words. We close by weaving two circles in opposite directions. Singing into each others eyes and hearts. Filling one another with the nourishment of community. Seeing the strong medicine that we each carry and hold. May the balance we have woven on our land today, and with each other grow and grow and grow until together we have created a world where the feminine and masculine can stand side by side as balanced and equal opposites. The witness and the witnessed, the seer and the seen, the hearer and the heard. There cannot be one without the other. This is a truth about our nature..no me…without you.. no man without woman…no day without night. We are one and many…we embody paradox. We hold opposites in our hand.